I’m always looking for ways to use Quinoa in some of my favorite dishes. This time, I used it to replace rice in stir-fry. Don’t let the long list of ingredients scare you, this dish really is easy and tastes like something you would get in a restaurant! I almost picked up a bottle of stir-fry sauce at the store but check what the ingredients were first. They were all things I had in the house so I decided to google a recipe for stir-fry sauce and give it a try. It tasted great! 1. Mix the ingredients for the sauce in a bowl. Set aside. 2. 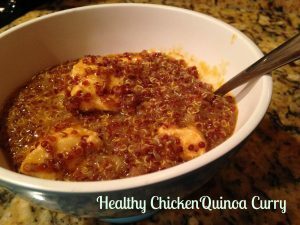 Combine the quinoa and chicken broth in a pot and bring to a boil. Cover and simmer for 15 minutes. 3. In a skillet heat the oil on medium high. Brown the chicken for 1 minute on each side. 4. Add the snow peas and lower the heat to medium. Cook for 5 minutes. 5. Add quinoa, stir-fry vegetables, sauce and egg. Bring to a boil. 6. Lower the heat to a simmer and cook 5 minutes or until the chicken is done and snow peas are tender. It was the last day of my Christmas vacation. I was bored and hungry and decided to make something healthy for lunch using what I had in the house. Adding buffalo sauce put a fun twist on an easy-to-make meal of tuna patties. 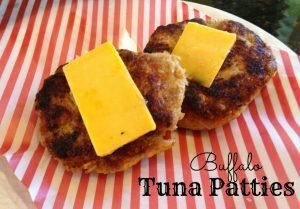 These tuna patties would also be great as an alternative to burgers, just serve them on a bun instead of using beef. Heat the oil in a skillet on medium high. In the meantime, drain the tuna. Mix together the tuna, bread crumbs, buffalo sauce and mayo. Season with garlic powder, pepper and salt. 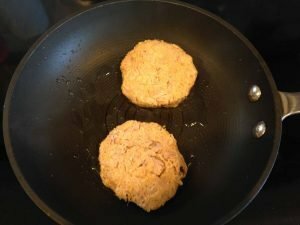 Shape into 4 equal patties. Cook in the skillet for 1 minute on each side or until browned. Bring the heat down to low and cook for 2 minutes. Serve with a slice of cheese on each patty. 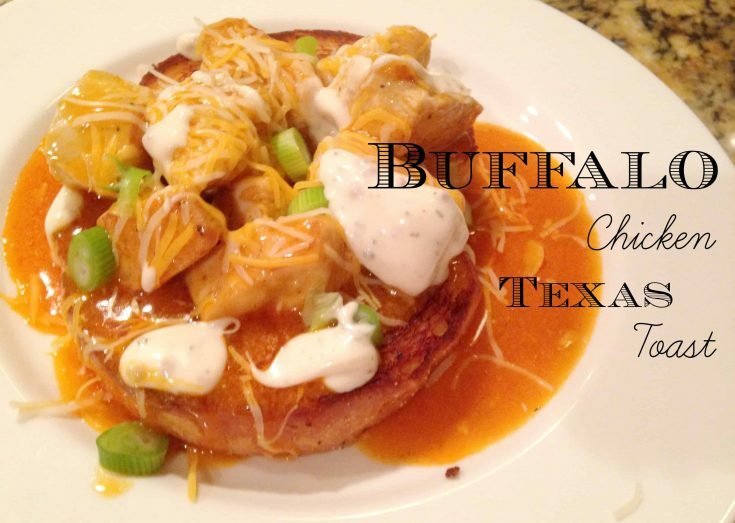 I love anything Buffalo Chicken, so when I found this recipe on Pinterest, I just had to try it. In fact, this was the first meal I ever cooked for my boyfriend when we first started dating (yes, he was impressed). This dish is loaded with so much good stuff, starting with crispy texas toast and layering on buffalo chicken, lots of cheese, green onions and ranch dressing. 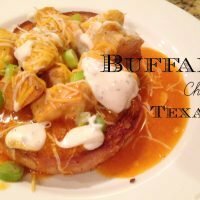 I’ve tried several kinds of buffalo sauce and found that Texas Pete Extra Mild Buffalo Wing Sauce (pictured above) has the best flavor. 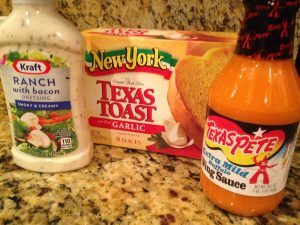 You can’t go wrong with the texas toast, the garlic one works well or if you love cheese get any of their cheese topped varieties. Heat the olive oil in a skillet over medium high heat. Season the chicken with salt, pepper and onion powder. Brown the chicken on both sides (about 10 minutes). Add garlic and stir. Add the buffalo sauce and butter and stir until the butter is melted. Lower the heat and simmer for 5-10 minutes or until chicken is fully cooked. Meanwhile, cook the texas toast according to the directions on the box. Once the toast is done, spoon some chicken and sauce over the top of each piece of toast. Sprinkle with cheese and onions and top with a drizzle of ranch dressing. Last night, I had a goal to make a meal that was light and healthy but still tasted like comfort food. Tilapia and quinoa are two of my go-to’s for healthy meals that make you feel good. I typically cook quinoa with water, but decided to try cooking it with chicken broth to give it more flavor. It turned out great! You can do this with any meal by substituting equal parts chicken broth for water. I also added southwest style canned corn and tomato and basil feta to the quinoa to give it an element of comfort food. Put the broth and quinoa in a sauce pan and bring to a boil. Lower to a simmer, cover and cook for 15 minutes. In the meantime, heat up olive oil on high in a skillet. Season the tilapia with onion powder, garlic powder, salt and pepper. Brown the tilapia for about two minutes on each side. Lower the heat to medium and cook for 5 minutes or until fully cooked. Once the quinoa is done, stir in the corn. Remove from the heat and let cool for 5 minutes before adding the feta. 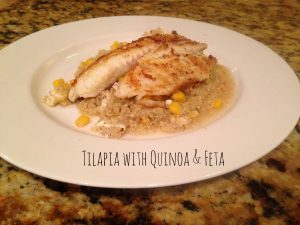 Divide the quinoa mixture on plates and top with tilapia. Makes 4 servings. Curry has become a dish I cook regularly and the fun thing is, it turns out different almost every time because I like to try different things with it. Feel free to get creative with this dish, its hard to mess it up! 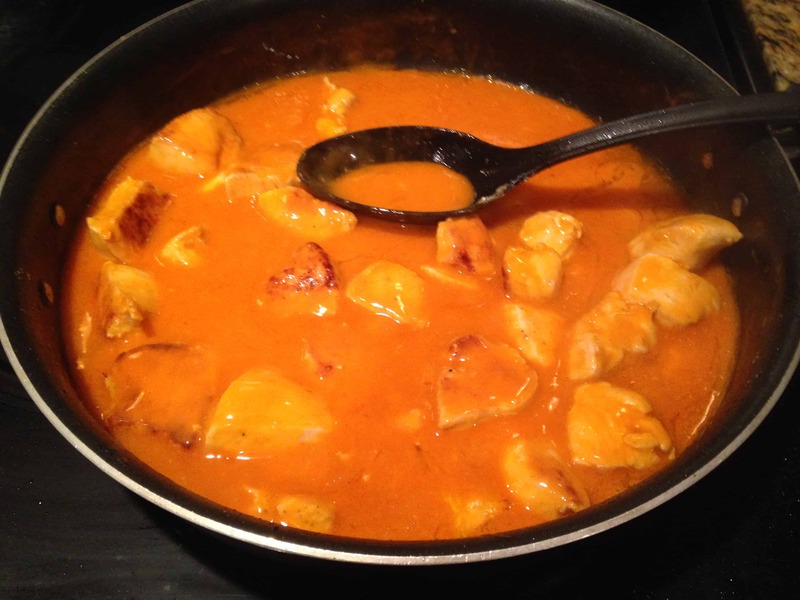 The recipe below is just one of the ways I make curry. 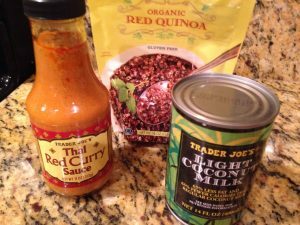 I almost always use Trader Joe’s Thai Red Curry Sauce because it tastes the best out of all the pre-made curry sauces I have tried. I love making it with quinoa because it’s healthy but I have also tried making it with brown rice and orzo. Let me know if you try something else! The trick to making this curry taste so good is allowing it to simmer for 15-20 minutes or more once you have added everything. 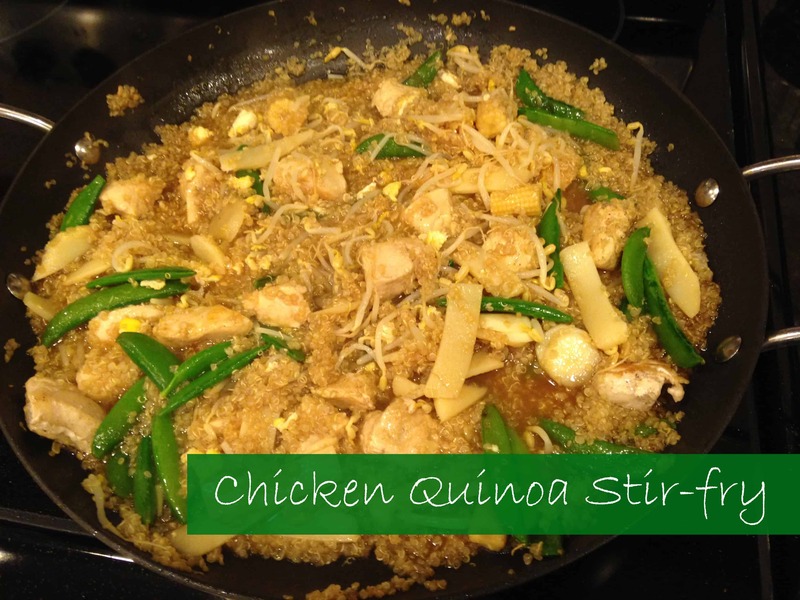 This lets the chicken and quinoa absorb the flavor of the sauce. I’ve found that this curry is even better the next day, so I like to make extra so that I’ll have leftovers. In a skillet, brown the chicken on high for 2 minutes on each side. Cover and cook for 5 minutes. Add the curry sauce, coconut milk and prepared quinoa, stir. Cover and lower the heat to a simmer. Cook for 15-20 minutes, stirring occasionally.